Hi everyone! Welcome back to another Dream. Create. Inspire. Link Party. It’s been a bit crazy here with more boy’s room renovations :). We have been experiencing the most beautiful weather here in Pa. Although all I want to do is to be outside on my patio we have still been plugging along on Ryan’s room with this past week adding bead board ceilings and wide pine floors. If this is your first time here to this link party it is hosted by five different bloggers (me included). Our party starts every Tuesday night at 8pm (7 CST) and runs through Friday night at 11pm (10 CST). For the next 3 days, a lot of bloggers will link up their favorite DIY projects, gardening and decorating tips, recipes, crafts, travel tips and more. Just click on the links below and it will take you to that bloggers post. Please keep checking back throughout the week so you don’t miss any posts! 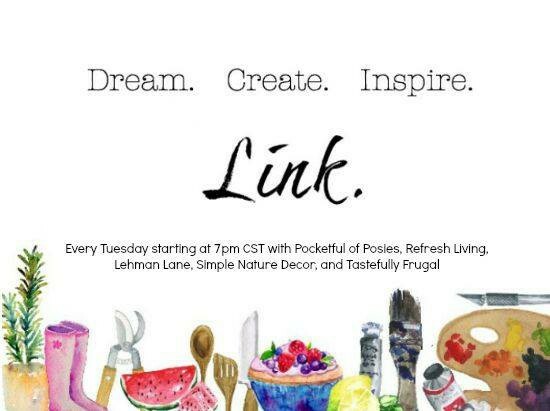 Link parties are a fantastic way to meet other bloggers and get inspired! 4. Be a Good Party Goer and visit at least 3 other posts and don’t forget to comment! We will try our best to visit and thank you too. * Each week we will pick 5 of our favorite posts and the last link party’s most clicked post and feature them on our next Dream. Create. Inspire. Link. Party! We will also share these posts across our Social Media Accounts, including pinning a pin from the original article on our Group Board so don’t forget to follow along! Dream. Create. Inspire. Link. Pinterest Board. Don’t forget to add a button if you were featured!!! Thanks so much for joining our party! Hope you’re having a great week. The party looks great again! Thank you! So glad to have you! Sharing a fun roundup this week of front porch makeovers. Hope you’re having a nice week! So glad to have you Erin! Hope you had a great week too! So glad to have you Jen! Thank you so very much for the feature and for hosting a great party. I hope you have a really great week! Thanks for hosting Tara! Have a nice Wednesday! Thanks so much for being a faithful party goer Katrin:). I absolutely love that all-white living room! Thanks so much for featuring my hanging planter boxes! Have a great day! You’re very welcome Sara! Thanks so much for linking up!!! So glad to have you at the party Terry!